artist name and contact info please? - Would like info for sculpture of figure balancing on ball. I believe Hunter Kirkland Gallery represents this artist. I am not sure of the artist's name. Yes, where is the sculpture from? Statue - Who is the Artist???? 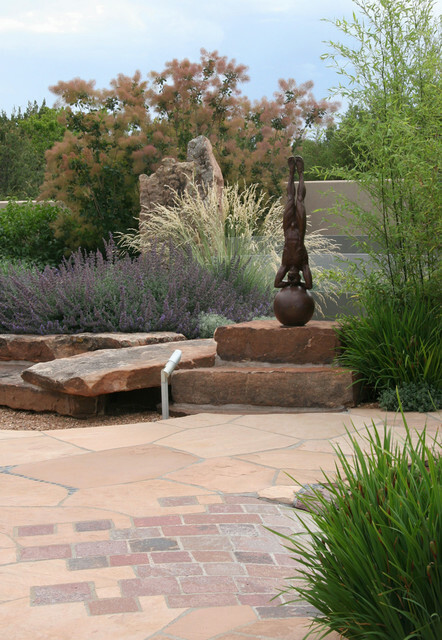 Sculpture can also act as a period in a garden. This piece serves as a focal point at the end of a path.Treating your garden as a written narrative can inject new life and meaning into it. Period. Purchased objects. Most of us will probably purchase garden art from galleries, online sources, directly from artists or even from architectural salvage yards. Pieces are available for every taste and budget, but it’s helpful to follow some important guidelines by asking yourself the following questions: Does the piece relate to the architectural style of the dwelling? Does it relate to the garden’s sense of place? Is it something that appeals to your personal aesthetic? I like the walled patio with areas for plants and stone. Most of us will probably purchase garden art from galleries, online sources, directly from artists or even from architectural salvage yards. Follow these important guidelines: Does the piece relate to the architectural style of the dwelling? Does it relate to the garden’s sense of place? Is it something that appeals to your personal aesthetic?